This sewer runs along Zhengshang Road, in Zhengzhou, China. 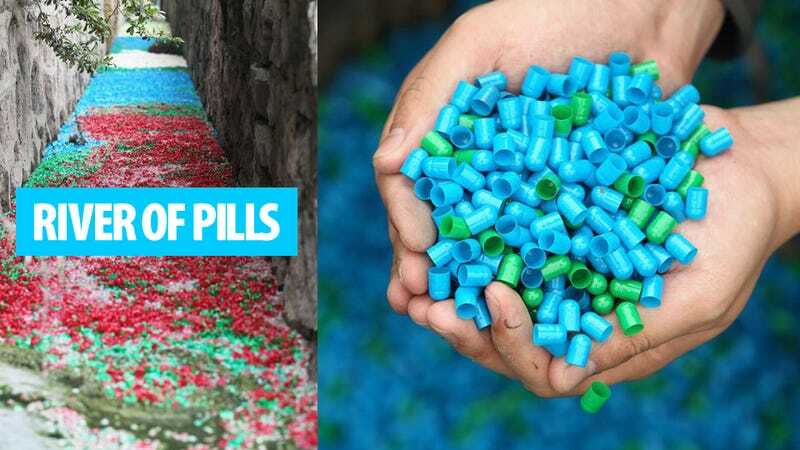 On April 21st, the strangest thing happened overnight: it got covered with pill capsules. Pill capsules everywhere, gazillions of them, turing the water into a gross soup of colorful molecules. Nobody knows how this happened. There are no pharmaceutical factories nearby. Months ago, there was a small pharmaceutical shop, but it was closed by the authorities. They think it may be a secret laboratory, but nobody knows anything about it and the police has no leads.